Omni Cable 24/1P Low capacitance computer cable with 100% aluminum polyester shielding, has a voltage rating of 300-Volts. The twisted pair cable with foam flourocopolymer insulation, has an insulation thickness of 0.015-Inch. The low-smoke PVC jacket in orange color, has a thickness of 0.014-Inch. Tinned copper cable has a nominal outer diameter of 0.134-Inch. 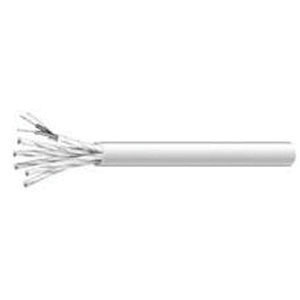 It has a nominal capacitance of 11.8 pF/ft and withstands a temperature of 75 deg C. This cable features low dielectric constant and a dissipation factor to offer high-speed and low distortion data handling. It is suitable for computers, communications, instrumentation, sound, control, audio and data transmissions. The computer cable meets CMP and CL2P standards.